Spring Creek Ranch is owned and operated by three generations of the Belsby family. Owners Gary and Louise Belsby run a cattle, wheat, and hay ranch outside of Cheney, Washington. Gary’s son Daren Belsby and his wife, Sarah Berns and their children manage the day-to-day operations at Spring Creek Ranch. Daren is also a smokejumper at the North Cascades Smokejumpers Base and Sarah is a Doula and writer. She has been named a Finalist for the Sundance Writers Lab three times. 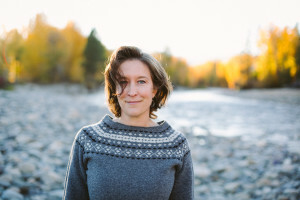 Sarah Berns first came to the Methow Valley from Massachusetts in 1995 to work for the US Forest Service. She rappelled out of helicopters, jumped out of planes and hiked into fires all over the West before managing Spring Creek Ranch. When Sarah isn’t working on the ranch, you may find her writing. She is passionate about building a new library for the greater Methow Community. Daren Belsby’s family purchased Spring Creek Ranch in 1976. He lived in the Ranch House for much of his childhood. 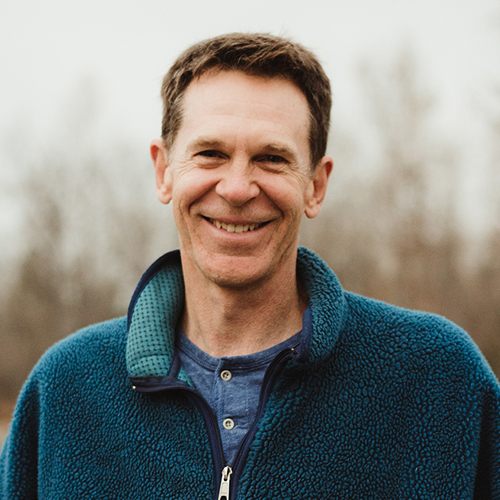 Daren became a smokejumper in 1985 and spent his winter seasons traveling the world. He then remodeled the Ranch House and designed and built the Ranch Cabin. With his vision, Spring Creek Ranch has become the rental property that so many guests have come to know and love. When Daren isn’t running the North Cascades Smokejumper Base he can be found farming our alfalfa fields. If you’re lucky you may catch sight of Daren darting around Spring Creek Ranch constantly fixing or improving something. Ayla Belsby is Spring Creek Ranch’s kitten finder extraordinaire. When the barn cat has kittens Ayla usually spies them before anyone else. 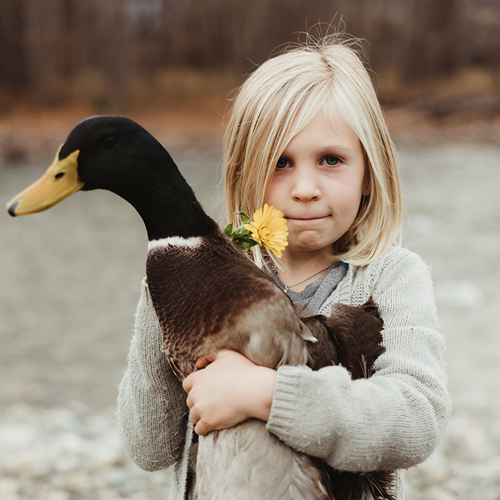 Ayla manages our flock of 20 free ranging chickens, bottle feeds our calves and has her heart set on adding goats to our menagerie. 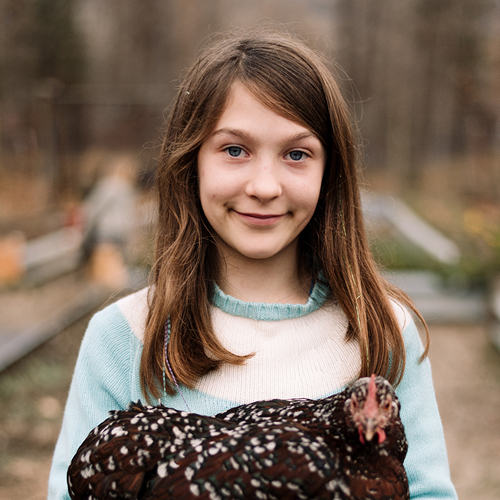 Ayla is passionate about insects, trees and has helped Daren plant and care for the hundreds of saplings we’ve planted at Spring Creek Ranch. Favorite place on the ranch? On the hammock down by the river. Favorite thing to do at Spring Creek Ranch? What’s your favorite thing to do at Spring Creek Ranch? Go swimming in the pond. Where’s your favorite place to hide on the ranch? Methow Indians hunted and fished along the banks of the Methow River for thousands of years. One of their favorite camping spots was at the confluence of the Methow and Chewuch Rivers. Each spring an abundance of salmon made their way from the Pacific Ocean, up the Columbia River and swam back to their spawning grounds along the banks of the Methow River and her tributaries. This confluence of two beautiful and fertile rivers caught the attention of white settlers, as well as that of generations of Native Americans. In 1900 Walter Frisbee purchased an additional 15 acres from some of Winthrop’s first settlers, James and Louisa Heckendorn Sullivan. The Sullivans owned and operated a log hotel for the increasing number of miners, settlers and trappers making their way through the Methow Valley. The Sullivans charged 25 cents per horse and 50 cents per human to stay at their hotel. In 1903 Spring Creek Homestead was sold for $3,500 dollars. Between 1903 and 1917 the property was bought and sold several times. In 1917 Robert Williams, the current owner left the property to his daughter Maybel White and her children. The Whites grew corn, alfalfa, wheat, barley and oats on Spring Creek Ranch. 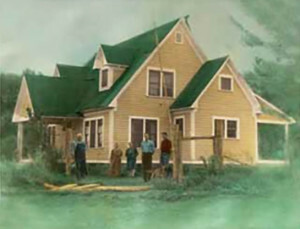 In 1929, the family built the original Spring Creek Ranch House. The family literally built the house by hand, since there was no electrical power in the valley at this time. They utilized the plethora of locally milled lumber from the surrounding forests and hand-picked each piece of wood so carefully that there isn’t a single knot in the house. The Whites built the 100 foot long wooden dairy barn, still standing today in fine form, in 1936. They ran Spring Creek Dairy until 1952 when federal law mandated the use of stainless steel equipment and structures. This law put most small dairies out of business. The Whites continued to keep farming and saved a few Jersey cows, some beef cows, chickens, and ducks until 1976 when it was sold to Marilyn and Gary Belsby. The Belsby family ran a cow/calf operation on Spring Creek Ranch until 1982. Utilizing the 100 acres that were left from the original 160 acre homestead, plus several forest service grazing permits, the Belsbys built up a herd of several hundred cows. The original Spring Creek House was completely renovated and remodeled in 1991 by Gary and Marilyn’s son, Daren. Bob Rivard, Daren Belsby, Jeff Blanchard and Brian Belsby built the additional Spring Creek Ranch Cabin in 1997. Today Spring Creek Ranch grows alfalfa hay, keeps chickens, ducks, horses and a few cows. The main Ranch House and Cabin are available year round as nightly vacation rentals. See you there! Heartfelt gratitude to the following friends and family who contributed to our website: Gary and Louise Belsby, Mara Zepeda, Arthur Shwab, Tim Matsui, Ryan Flynn, Megan Kosel, Sol Gutierrez. Our website was designed by Sarah from Aeolidia. 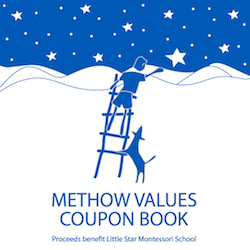 Look for Spring Creek Ranch in the Little Star Montessori Coupon Book.